At one point there was a talk of Mr. Murthy as Presidential Candidate. Though one wonders what Kind of succession planning and management bandwidth the company created that he has to come back that two with his son in tow? And we blame the netas to promote their sons? Well constructed doodle mysay, especially the turban part. Thanks Jeet appreciate your compliment ! Hilarious cartoon! Good to see you active at least on your blog 🙂 🙂 🙂 God bless! hello ?? … 🙁 dont you say so pleasseee!! you can ask your sets if you wish to.. Some sigh of relief for Infosys .. they will be back on track … but coming to the doodle .. it was funny when you added Mr. Manmohan Singh to the scenario .. the question and answer were sarcastic and funny both at the same time … Well narrated and connected with the current affair … as always you never fail to make us laugh .. Perfect. Just a crazy idea… what will happen if the two characters are swapped? 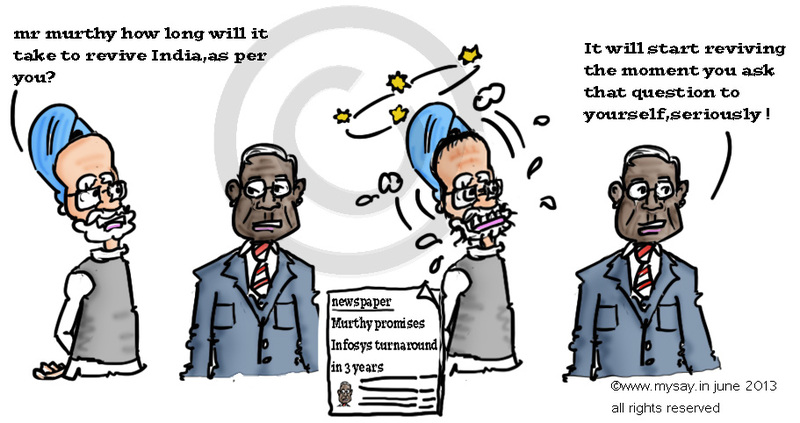 Dr. Manmohan Singh as the executive chairman of Infosys and Mr. Murthy as the PM. One thing is pakka… Manmohan Singh will miss Soniaji the most. Glad your internet issues are sorted too!! Now this topic I had an additional interest in!! He just doesn’t knows how it feels…to be anyone…anything! Making a fool of public isn’t really easy…without a flattering wink! He can provide you with a new source, in it then, he’ll make you sink! We have voted for the government, which actually selected him! So better divert your mind to your work or maybe gym!! It’s coming to an end…but it has been real bad! I’d be happy to have a new P.M. then be it black or be it red! I’m atleast having a new hope…so as of now I’m really glad! poetess ..you create a thunder with your wonderful poetic comments !! I am curious to know when do these ideas storm you…..surely not like Archimedes…y’ know the eureka story, don’t you ? yes Eureka Forbes 😀 😀 😀 ..
Life seems to be keeping you entangled in dailies 🙂 No posts !! A loaded question; sure, Dr, Manmohan has no answer. like always bang on target! this one is such a true mirror of the present situation 🙂 Welcome back! Oh My God! Amazing……Where do you get such ideas, JR? Nice take. Mysay, never uchhalo/remove a sardar’s pagrhi. Not even as a joke. Seriously. They are very very touchy about that. hmm !! I apologize for that Madhu! But that is the thing, in India, in the name of Religion,Ego and Money comes first Humanity comes no where ..
we can kill in the name of religion .. how much do we respect humanity and our nation is a controversial question none can answer..
Everyone in India is touchy about religion … be it the majority or the minority . My intentions were not wrong .. as for me Nation comes first !! Thanks My Say. You know I agree with what you say. Am glad to see you have changed the cartoon a little. This will ensure that your message is not hijacked by other agendas of trouble makers.. Thanks again for reminding me of crossing lines under the banner of healthy humor ..
LOL! The moment he starts speaking, it will be a big change. Well….. I am impressed to see this side of yours. Over the last 4 years I kept wondering what are you upto. But now I am proud to see that you have hammered it real hard this time. I wish you all the luck possible to be with you that exists between heaven and earth. I am grateful to you for showering words of praise and sincerely overwhelmed. The punching bag of all cartoonists! Really good. I like this perfect answer. thanks Cynthia 🙂 Appreciate your compliments dear friend !! Alas the economist has brought the nation to the brink of disaster. I wonder if he even looks in the mirror anymore. And as usual he is speechless..sad!! In these days of slapstick yours is a creative one with its subtle humour and reality. Yet another great post. Tough question about India there . A whole lot of things need to change ! or probably things will remain the way they are .. who knows .. aint it !! Thanks for dropping by friend ! I am glad you liked it 🙂 Sonia … I understand .. dailies demand too much of involvement ! i remember you posted about a new job you joined a month back,i suppose ! How is it going ?